Mueller's exclusive HYDRACINN fabric is the moisture-wicking catalyst for maintaining superior support with heat management. Base sleeve is made of antimicrobial fabric that is uniquely breathable, extremely soft to the touch with flatlock seams, and features a conforming hourglass design. Mueller&apos;s exclusive HYDRACINN fabric is the moisture-wicking catalyst for maintaining superior support with heat management. Base sleeve is made of antimicrobial fabric that is uniquely breathable, extremely soft to the touch with flatlock seams, and features a conforming hourglass design. Inner grip strips complete the anti-sweat/non-slip design to help prevent brace migration and preserve high-performance support. This comfortable and lightweight stabilizer provides support for stiff, weak, unstable or sore knees. Unique hourglass design of base sleeve is form-fitting for superior support. Supportive steel springs support both sides of the knee, yet allow leg flexion and extension. 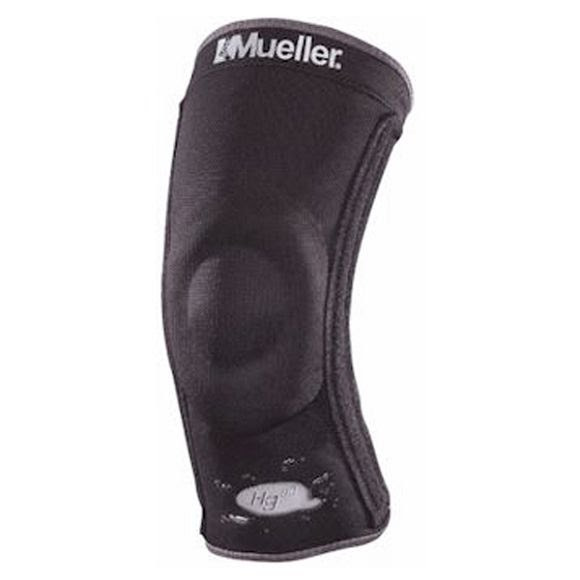 Reinforced gel buttress is lightweight and provides comfortable patella support to stabilize and protect the kneecap.